Tony Dungy and I first met in 1997, a year after he became head coach of the Tampa Bay Buccaneers. Since that time, he and I have worked side-by-side helping men to be the best fathers they can be through our All Pro Dad program. 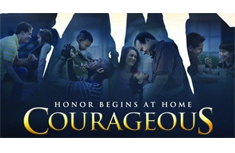 In the movie, Courageous, (now on DVD), five men take different roads toward their goal of being a “courageous” dad. View it with your wife or older children and see the results of their individual journeys. What other things would you add to this list that a courageous father must do?